As a young painter in the early fifties, Mitchell – who came from a literary family in Chicago – schooled her eye in the work of the older, or “first generation,” Abstract Expressionists. She relished the pungent reality of paint and shared the conviction of the period that in the right hand, the brush could register every tremor of the soul. Her early work, while always well-made, owed too much to her masters. It was in the sixties that – as the exciting show organized by Jane Livingston at the Whitney Museum of American Art suggests – she found her way. Under great emotional stress, Mitchell, who never yielded to the overblown huff-and-puff typical of “second generation” artists, painted a cycle of pictures that she called her black paintings. These pictures, while not actually black, were among the bleakest of the era – an inner storm of rage and tears. She seemed to claw and smear the paint onto the canvas. And she found a certain color, a kind of clotted olive green, that perfectly defined the slow squeeze of despair. But rage and despair were not Mitchell’s principal intoxications. In 1959, she moved to France and became, in much of her work, an abstract landscape painter – a Dionysian blissfully besotted by the colors, forms, and lights of nature. Her pictures sometimes seemed as physical as a wet meadow underfoot or a heavy mist on the cheek; the paint itself often had the texture of the earth. She worked over the years with many different moods and scales – of spirit, size, and color – but almost invariably sought to raise her intense physical sensations into a kind of transcendent rapture. In the series “La Grande Vallée,” she imagined the secret Edenic places in nature that children and adolescents retreat to and dream of inhabiting. She also made large multi-paneled paintings that were often likened to Monet’s water lilies, a comparison that irked her. But she certainly wanted to make paintings that enveloped the eye. Salut Tom, probably her most direct homage to the French Impressionist, has the lazy, floating rhythm of his summer ponds. For the art world, this exhibition should be news. 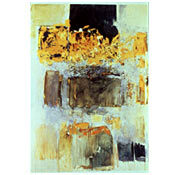 The Paintings of Joan Mitchell is the first significant showing here of the artist’s work in almost 30 years. The catalogue includes fresh biographical and critical analysis, and there are some unfamiliar paintings from her estate on view. What’s particularly surprising, however, is how challenging and even remote her ambition now appears. For Mitchell, a painting could still encompass the grand passions; the gruff and sometimes angry persona concealed a sensitive romantic. Educated, smart, knowing, and sophisticated, she was somehow innocent of irony and not afraid to celebrate pleasure; the sublime intoxications that earlier societies once respected she claimed for her own. She died not long ago – but oh-so-long ago.